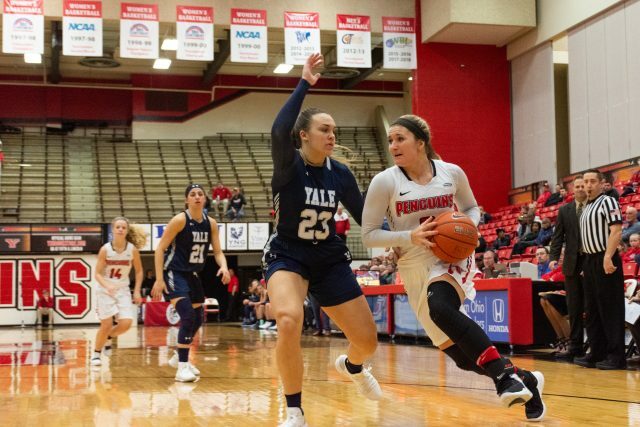 The Youngstown State University women’s basketball team is in a lull in their schedule, only playing one game this week, a 4:45 p.m. tip-off on Saturday against St. Francis University from Pennsylvania. The Penguins are 6-2 and sit in a tie for the best record in the Horizon League with Indiana University – Purdue University Indianapolis. The team has shot much better since then, capturing two victories over the University of Akron and Canisius College. The Penguins are coming off of last week’s 62-36 victory over Canisius where senior Alison Smolinski set a school record with nine 3-pointers in the win. Smolinski finished with 29 points, just one point shy of her career high that she set twice in her sophomore year. Smolinski also increased her career 3-pointers total to 184, moving her past Monica Touvelle into fifth place on YSU’s career leaders list. It’s not just Smolinski that’s feeling better. Chelsea Olson is as well, after her stellar performance against the Zips. Olson shot 55 percent from the field, and 90 percent from the free throw line against Akron, scoring 22 points, marking a career high for the sophomore. It took until three minutes left in the third quarter for Olson to miss her first shot of the night. Getting her confidence back has been the key. The team has impressed on the defensive side of the ball ranking first in the Horizon League in overall defense, perhaps no one more as an individual than McKenah Peters. Peters limited Akron’s leading scorer Megan Sefcik to seven points on the night. Saturday, the Penguins mens and womens teams are hosting a double header, with the men squaring off against Western Michigan University and the women hosting St. Francis of Loretto, Pa. The women’s team takes ten days off before heading to Lewisburg, Pa. to take on the Bucknell Bison. 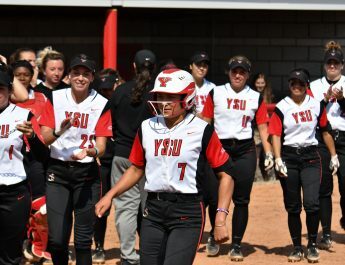 YSU hosts St. Francis on Dec. 8 before getting a week and a half off.